I have been told off by my friend today for not posting on my blog so here is a layout I have done. 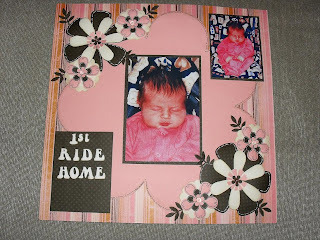 The pink layout I did at a Craft Den Thursday night scrapbook class last year and the blue one is the one I made to go with it. 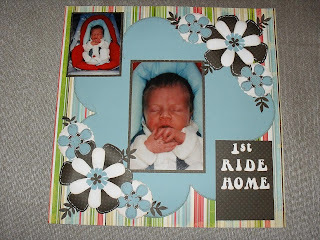 It is of my son & daughter's 1st ride home in their car seats. I have to finish off the blue layout by adding dewdrops to the middle of the flowers. I had to scan the flowers from the pink layout so I could cut them out on my Craft Robo lite (which was my Christmas present from my OH and kids), as I don't have a cricut. My son is now 13 1/2 and nearly 6' tall, and my daughter is 10 and still as cute.